What is the ISS or International Space Station ? 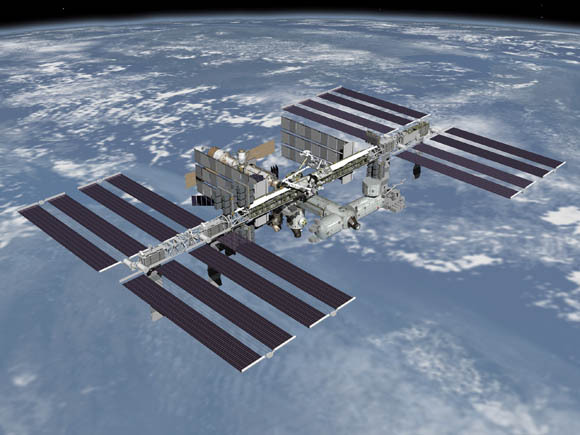 The International Space Station is a large spacecraft. and is one of the brightest objects in the sky. It orbits around Earth. It is a home where astronauts live. It is also a science lab. Many countries worked together to build it and they also work together to use it. The space station is made of many pieces. The pieces were put together in space by astronauts. The space station's orbit is about 220 miles above Earth. NASA uses the station to learn about living and working in space. These lessons will help NASA explore space. The first piece of the International Space Station was launched in 1998. A Russian rocket launched that piece. After that, more pieces were added. Two years later, the station was ready for people. The first crew arrived in October 2000. People have lived on the space station ever since. Over time more pieces have been added. NASA and its partners around the world finished the space station in 2011. The space station has many parts or modules. The first modules had parts needed to make the space station work. Astronauts also lived in those modules. Modules called “nodes” connect parts of the station to each other. Labs on the space station let astronauts do research. On the sides of the space station are solar arrays. These arrays collect energy from the sun and turn the sunlight into electricity. Robot arms are attached outside and were used to build the space station. You can observe the space station as it passes overhead if the sky is clear and not cloudy. You can use the link below to check on times when it is due to fly overhead near you. By default we show times near Leeds, but you can key in your location to obtain local times specific to you.